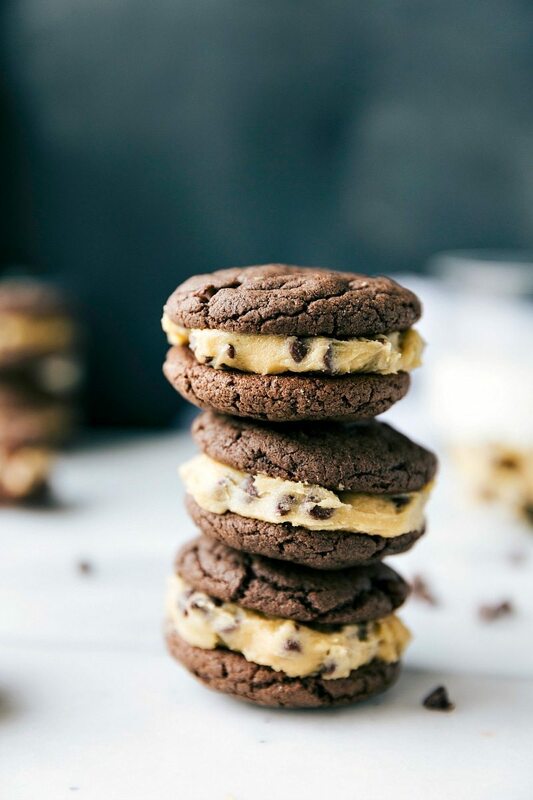 Cookie dough frosting in between two soft chocolate cookies. 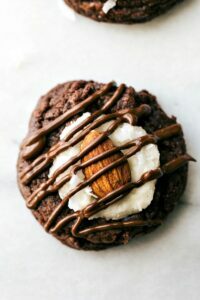 The chocolate cookies have only 4 ingredients and take less than 5 minutes to make! So, guess what hit the shelves two days ago? LIMITED EDITION Cookie Dough Oreos. Unfortunately, I have not tried out the cookie dough Oreos (yet). But since I’m terrible at waiting; I created these cookies! They aren’t quite like a crisp and crunchy oreo, but they’ve definitely got some of the aspects — super chocolatey and packed with good flavors. 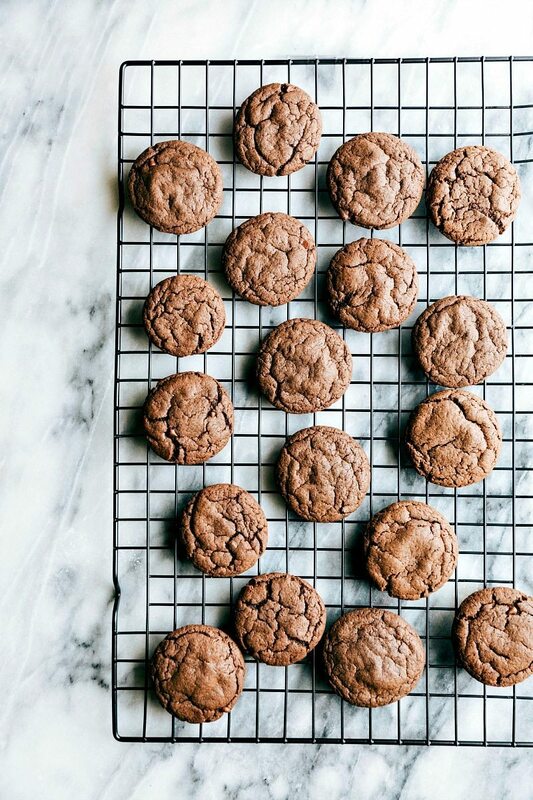 The best news is, the chocolate cookie base is only FOUR ingredients. It uses a cake mix + pudding mix to make up the base and then eggs + shortening or butter. The frosting has a few more ingredients, but it’s all pretty quick and easy! 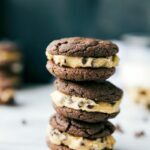 The frosting is essentially eggless edible cookie dough and it is rich! 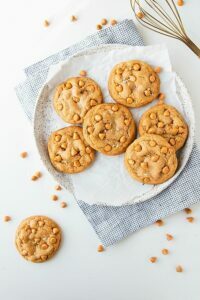 It’s definitely the star of the show with these cookies! Pour a large glass of milk; you’re going to need it! Preheat the oven to 350 degrees F. Line a baking sheet with parchment paper or a nonstick baking liner and set aside. In a very large bowl, combine the cake mix and pudding mix. Add in the eggs and shortening (or butter). Beat until just combined. It may seem crumbly at first, but it will come together. Using a tablespoon measuring spoon, measure out the dough. Each ball of dough should be exactly 1 tablespoon. In a medium-sized bowl, combine the room temperature butter and brown sugar. Beat until light and creamy. Add in the salt and vanilla extract. Mix. Add in the flour and miniature chocolate chips and mix until just combined. Add in the milk, 1 tablespoon at a time, until desired consistency has been reached. If your frosting is too dry add 1 tablespoon extra milk and if it's too wet, add in some extra flour. Once the cookies are baked, let them sit on the pan for 3-4 minutes and then transfer to a cooling rack to cool completely. 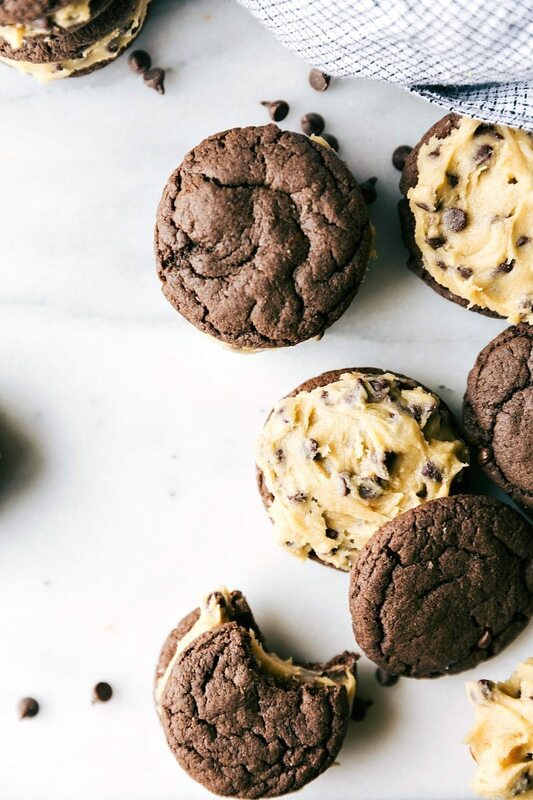 Once cookies are completely cooled, frost one cookie with the cookie dough frosting and press another cookie on top. You are the homemade oreo queen! I’m loving your Oreos this week, Chelsea, and these look seriously amazing! Haha!! always love your comments Christine! 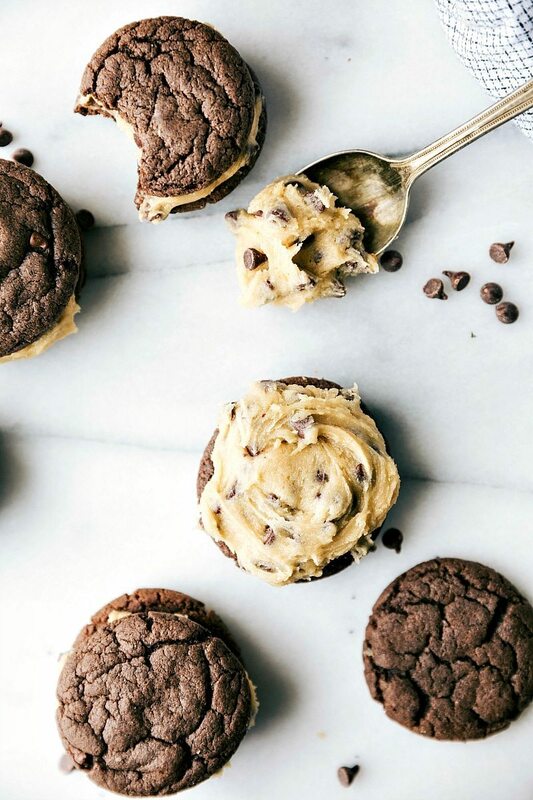 Oh boy, homemade Oreos and cookie dough frosting together? I’m in love too – seriously ah-mazing girl! Thanks so much Kelly 🙂 Hope you are doing well! Thanks Alyssa! Haha hopefully I’ll get a good recipe for them down soon! great idea. they look yummy! Chelsea, you are a genius! What a great idea to make the new flavor of oreos. I much prefer the homemade version to the store bought and these look amazing! Can you come be my neighbor already? What a great idea! 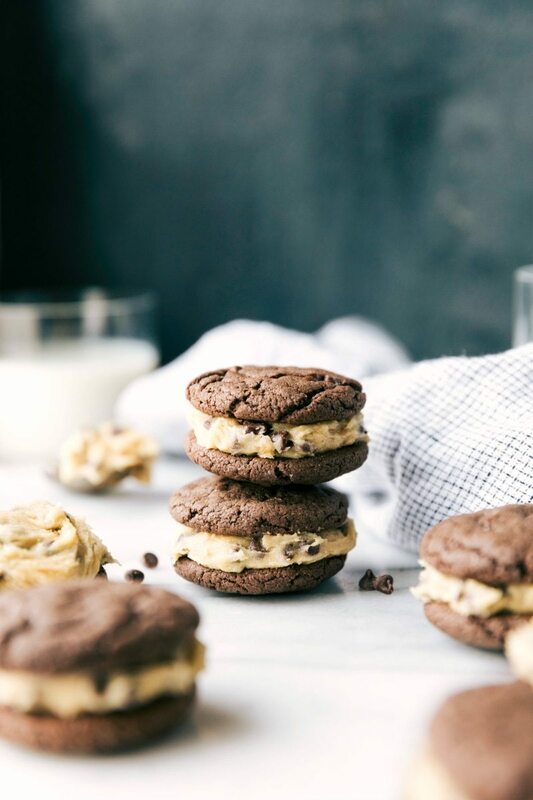 With recipes like this, who needs Oreo’s when we can make our own and stuff them as much as we want! LOL Pinned! Girlllllll no you didn’t!! I’d like to have these like IMMEDIATELY! I had no idea there were two new flavors of oreos. I am sure your homemade ones are much better. That cookie dough filling looks amazing! Oh boy, these look dangerous! I saw these on FB this morning and instantly went to the kitchen to make! Other than the frosting being a little too sweet these were SO delicious!!! Totally irresistible!! Thanks for linking up with What’s Cookin’ Wednesday! I love these! They look so tasty and the heart ones? I don’t even know what to say about them. They’re both just gorgeous!